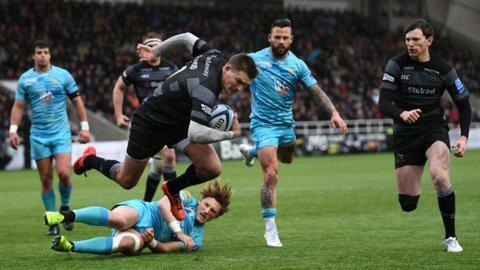 First-half tries from Zach Kibirige and Toby Flood proved enough for Newcastle to beat Worcester and close the gap on their relegation rivals to five points. Kibirige burst through to give Falcons an early lead before Flood kicked a penalty, sandwiched between two for the visitors from Duncan Weir. Flood then weaved his way through the Worcester defence to touch down. After a scoreless second half, bottom-of-the-table Falcons are a bonus-point win from moving level with Warriors. Newcastle got off to a perfect start thanks to Kibirige, who accelerated away from a loose ruck to cross under the posts and claim his third try in two games. Flood, who added two conversions as well as exchanging penalties with Weir, then ghosted his way through following a five-metre scrum to give Falcons an 11-point lead at the break. Kibirige also had a second try ruled out after he was adjudged to have lost control of the ball while touching down. Newcastle are now five points below 11th-placed Worcester and nine off 10th-placed Bristol with seven games of the season remaining. "Worcester are a difficult team to beat, but I thought in the first half we tore them apart. "We didn't quite keep up that intensity in the second half, and had we done so we might have been sat here with five points. "That's not to de-cry their ability, it was just down to the high intensity with which we had trained all week and the momentum we took into the game." "It was a disappointing result and a disappointing performance. They won the collisions throughout the first half and we weren't in the game in that first half. "The second half we struggled for territory and possession and, while neither side scored, our line-out didn't function and we made too many errors and as a consequence we could never get a foothold. "Newcastle fully deserved their win on the day. We were on the back foot from the off and they brought more energy, more urgency and they dominated the collisions." Newcastle: Hammersley; Kibirige, Harris, Williams, Sinoti; Flood, Takulua; Lockwood, McGuigan, Mulipola, Green, Davidson, Welch (capt), Graham, Chick. Replacements: Cooper, Brocklebank, Wilson, Witty, Nagusa, Stuart, Connon, Matavesi. Warriors: Pennell; Howe, Venter, Mills (capt), Heem; Weir, Hougaard; Waller, Singleton, Schonert, Bresler, Fatialofa, Hill, Lewis, Mama.